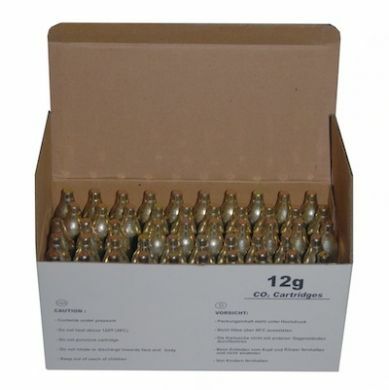 Box of 50 non threaded 12g Co2 cartridges - ideal for CO2 guns. Manufactured in Hungary by Liss Patrongyarto Kft. You should regularly lubricate your gun using a Silicone lubricant. 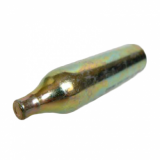 Our CO2 Cartridges are made of 100% recyclable steel, they are zinc coated and are not refillable. Ideal for use in Paintball markers and CO2 pistols & CO2 rifles - please double check gun takes 12g (NOT 12oz) cartridges! 4 x 12g will fill Motorcycle 180/55/17 tyre to 24PSI / 1.6 BAR. CO2 or Carbon Dioxide is an odorless, colorless, non inflammable gas with a light sour taste, it does not contain any minerals, salts or other solid ingredients. Cartridge contains 12g (15 Cubic cms) of Carbon Dioxide at approx 60bar/900psi. Cartridge contains 12g of Carbon Dioxide under very high pressure. Please only use with a device approved for this cartridge and follow manufacturers instructions. Non-aerosol. Non refillable. Recyclable steel. Storage and operating temperature: 3C (minimum) 50C (maximum). Do not take onboard an aircraft. If you are burnt by freezing CO2 you must immediately seek medical advice. A CO2 burn can cause deep tissue damage which is not immediately obvious at the time of the injury. Liss Patrongyarto Tolto Kft is a long established Hungarian company which manufactures compressed gas cartridges. Based in Repcelak not far from Budapest they are a family owned private company. We import their cream charger cartridges and various sizes of carbon dioxide cartridges. Liss also supply various parts and equipment which uses the gas cartridges they manufacturer - including soda syphons and cream whippers. Liss are ISO9001, ISO14001, TUV and NSF certified.